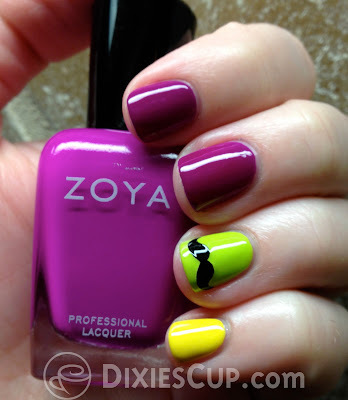 Today I am sharing a manicure featuring another Zoya from the Nail Mail I posted about last month. 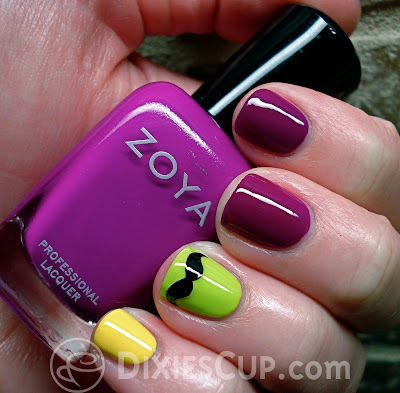 This is Zoya Charisma. The polish on my ring finger is Color Club Tweet Me, and on my pinky finger is Sally Hansen Insta-Dri Lightening. Charisma is a very bright shade of neon magenta/red-toned purple cream. As you can tell in the photos, it is brighter in the bottle than on my fingers. 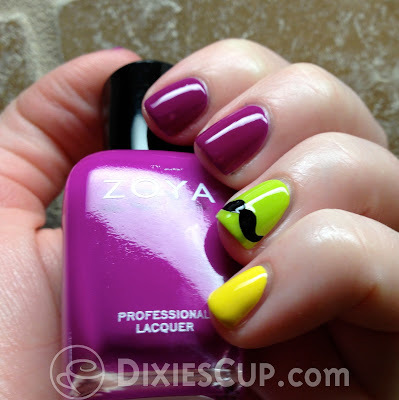 What you see above is 3 coats of Charisma, with a base coat underneath and top coat on top. In true neon polish form, it dries to a satiny finish and it is a little tricky to apply without dragging bald spots. My recommendation would be to wait for each coat to dry almost completely before adding another coat. Next time I wear this, I might try a base of white first to see if it makes the color bright like what's in the bottle. I also decided to add some of my mustache decals. I used these on one of the first manicures I ever blogged about. I'd like to think my skills have come a long way since then.